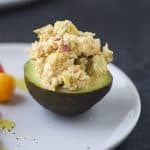 Healthy Tuna Salad Stuffed Avocado – an easy gluten free recipe perfect for lunch. To a small bowl add tuna, mayo, mustard, red onion, pickle, garlic powder, smoked paprika, and black pepper. Using a fork, break up the tuna a little bit and then mix all the ingredients together. Add mixture to each avocado halve and serve.